South Florida marks the northernmost range of the American crocodile, which stretches through the Caribbean to parts of South America. Throughout the breeding season (from February through June), they can be found in salty waters such as the Florida Bay. 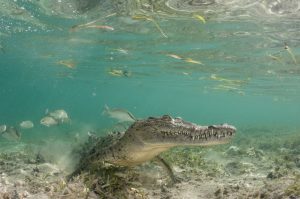 They spread themselves out during the rest of the year, even spending time in the freshwater habitats of the Everglades. After mating in February and March, females find a nest site on a sandy beach far above the high tide line. This expert intuition prevents her eggs from being washed away. While sandy shores near deep water are ideal, a mama crocodile won’t turn down a nest made of vegetation. 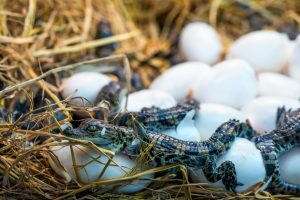 Crocodile eggs face threats like drying out or predation by egg-eating creatures. Unlike their relatives the American alligators, American crocodiles don’t regularly defend the nest. They visit it on occasion to check for hatchlings and help them out, as the newborn reptiles can’t dig themselves out of the nest. Alligators and crocodiles can be distinguished by the shape of their snout. Gators boast a broad u-shaped snout while crocodiles have a narrower v-shaped snout. The shape of the crocodile’s snout also causes it to bear some of its bottom teeth even with its jaw shut. Florida is the only place in the world that has a native crocodile and alligator, so this would be the place to see them both! Read more about American crocodiles in their species survival plan.